Order within 1day 20hrs 27mins for delivery Tuesday 23 April using next day delivery at checkout. The Complete Language Learning System! Learn It Now is perfect for travel, business, school or personal use. 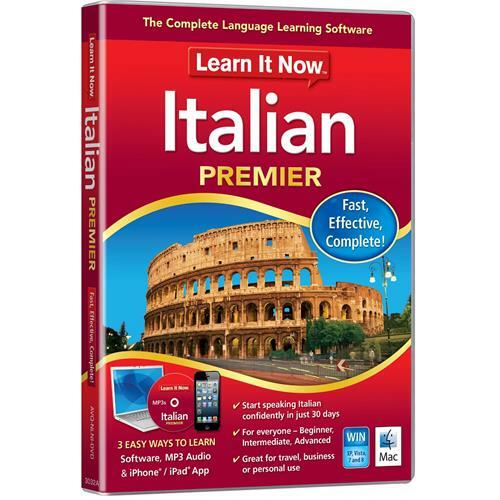 This innovative software is ideal for beginner, intermediate and advanced Italian speakers. You'll learn and improve your Italian in an immersive environment so you can speak confidently, and at your own pace. Experience for yourself how fun and easy it is to learn a language with Learn It Now – the complete language learning solution. Packed with interactive lessons, games and activities, you’ll feel confident with your new language skills in as little as 30 days! Whether you’re learning a language for travel, business, school or personal use, this award-winning language learning software will help you become fluent faster than you ever thought possible. BEGINNER: Learn and Speak naturally. Start with the basics such as greetings, introductions, travel terms, money, shopping and more! INTERMEDIATE: Know your way around. Learn to talk about your environment. Learn It Now makes it easy to ask for directions, order a meal or tell the time. ADVANCED: Start speaking with ease and confidence. Begin to express yourself in conversations using the speaking skills you have learned. 1. Use the software to immerse yourself in the self-paced learning system. 2. Master your speaking skills on the go with a complete Italian Audio Course. 3. Practice your vocabulary with audio and pictures using the innovative iPhone and iPad App - test yourself with word lists that match the software. Perfect your Italian accent! With advanced speech analysis tools, you can record your speech and compare your accent to that of a native speaker. By trying to match the visual voiceprint, you’ll quickly see where you need to change emphasis to ensure your accent and pronunciation is perfect!